ALLEGRA BOVERMAN/Staff photo. Gloucester Daily Times. 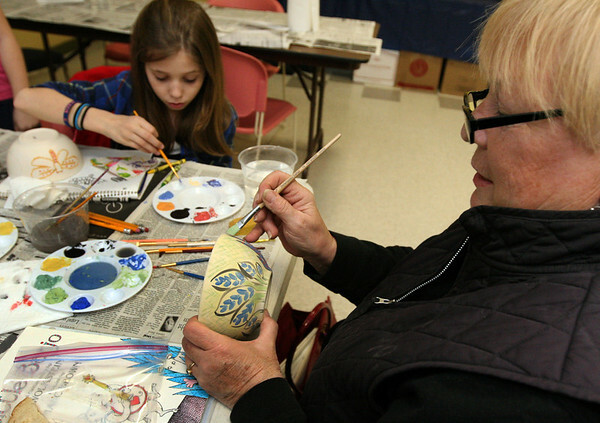 Gloucester: Sheila Schrank of Gloucester, right, and her step-granddaughter Alexis Wiswall, 12, of Revere, paint bowls together during the decorating night held at The Open Door Tuesday evening in preparation for the upcoming Empty Bowl Dinner on Thurs., May 10 from 4-8 p.m. at Cruiseport Gloucester. A second session for decorating will be held on Sat. Mar. 10 from 10 a.m. - noon at 28 Emerson Ave. in Gloucester. For more information, see foodpantry.org or call 978-283-6776, extension 205.